Academic-Minimum Credit Requirements-Permitting the students to attend S5/S7 till the publication of revaluation results - decided to include student representative in the organising committee of Sports Events and Tech Fest- Circular issued.Decisions taken at the meeting held on 18/09/2018 with the KTU syndicate Members at the office of the Hon'ble Minister for Higher Education. Vide Ref cited above, students who do not meet minimum credit requirements for promotion to S5 and S7 are granted permission to attend classes till the publication of revaluation results of S1/S2 and S1- S4 respectively. 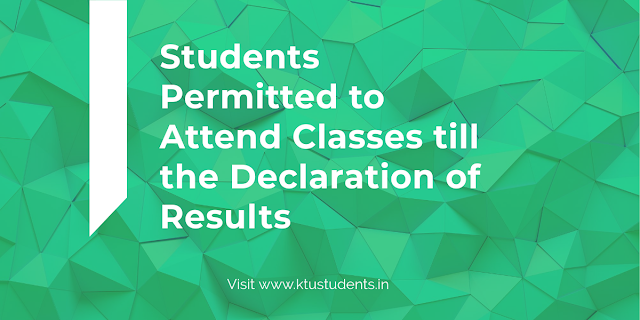 Those who fail to attain minimum credits after revaluation will not be permitted to continue their studies in these semesters.The students and their parents are required to submit an undertaking to the Principal to avail this relaxation. Moreover, Colleges are directed not to collect fee from these students until the publication of revaluation results. It has also been decided to include the student representative of Syndicate as a member in the organising committee of Tech Fest and Sports Events.